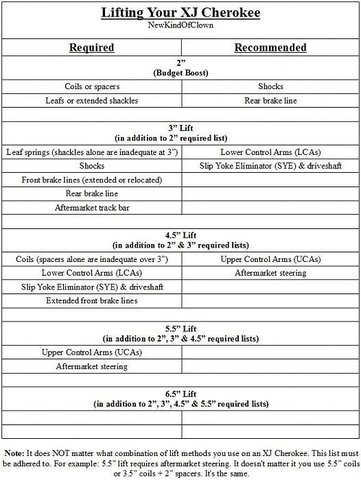 Okay so maybe a dumb question but I have a 97 zj with a 2 inch bb I'm installing a 3 1/2 inch rough country lift kit in the spring and was debating on adding my bb pucks to it, question is other than a tcase drop kit and track bar drop brackets what else would I need and is it even safe to do. drive shafts would probably be a better investment than drop kits, is the RC kit a long arm kit or just springs/shocks? if youre sitting 5 1/2" altogether with stock parts id imagine youre gonna have issues. Somewhere there is a list with all the necessities at a given height. It's meant for XJs but I'm sure the concept can be applied to you also. Let me see if I can find it. The RC lift is a full kit with lower control arms extended brake lines springs and shocks, and I'm opting for the quick disconnect sway bar links. You do know that the RC kits are the cheapest made and many avoid them for a lot of different reasons. That said you really need both U/L Adj. Control arms and an SYE with a new rear driveshaft. Depending on what tire size you plan on running 33" and up must have a gear change and then a good time to install lockers no extra cost in labor. You will need a good Dbl. Shear Adj. Track Bar also do it once and be done with it. It's all the small details that cost the most the cost of any lift kit is the cheapest part of doing it. I learned first hand that once you start going down that road the other stuff really adds up. like fred mentioned, if you go bigger tires you need to regear and while in there may as well add in a locker. and while you are adding the locker and regearing may as well rebuild the axle with fresh bearings and seals. but you start to think, since its apart I should probably install stronger axles. better locker? selectable?? same with a lift. SYE, new drive, possibly upgrade the TC shafts, stronger drive shaft since you are already doing the work. it all starts to snowball but its good you are asking the questions. at least you will be prepared for lighter checking account. ​​yeah I'm planning on about 3 year build wanting to turn my zj into a serious trail rig, I know I'm talking a lot of cash but if she turns out right it'll be worth it. And yeah was already looking into Spartan lockers.